Evanston Public Library is hosting a community-wide reading program this year called “The Big Read,” which focuses on engaging Latinos in the city. Evanston received $15,000 grant from the National Endowment for the Arts to help fund the program. Evanston Public Library launched a community-wide reading program Sept. 19 to engage the city’s Latino community. More than 100 people attended two events over the weekend put on by the library as part of “The Big Read,” a nationwide program of the National Endowment for the Arts to engage communities with literature. Events included a Mexican ceremonial dance group performance and a movie screening, said Jan Bojda, EPL’s youth services supervisor. EPL received a $15,000 grant from the NEA to distribute free copies of a selected book to the community as part of the program. “The Big Read” programming began this month and will continue at EPL through May, including hosting the author of “Into the Beautiful North” in March and a Dia de los Muertos celebration in early November. 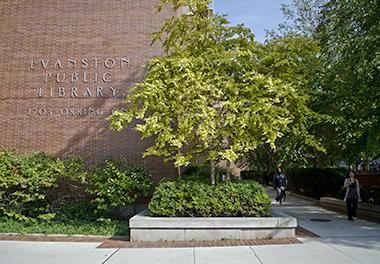 Evanston is one of more than 1,100 communities nationwide enrolled in the program, for which communities choose one of 37 selected books to read and build programming around the themes and topics presented. Programming will revolve around “Into the Beautiful North” by Luis Alberto Urrea. The novel details a 19-year-old Mexican girl’s story of her town struggling to survive after nearly all the men leave to work in the U.S., as well as her own journeys across the border. Bojda said the public seemed receptive to the introduction of the program and hopes to generate more excitement as “The Big Read” continues. Renee Neumeier, EPL’s young adult services supervisor, said she hopes the novel will encourage discussion about the conflict at the U.S.-Mexico border and explore what it means to be Latino today in the U.S. and Evanston, in particular. The book and corresponding programming will be available in both Spanish and English, Neumeier said. While EPL hosts “The Big Read,” Evanston Township High School will be hosting a book club for Spanish-speaking parents to improve their Spanish skills. EPL is funding the book club in conjunction with “The Big Read.” The program was started by Mercedes Fernandez, ETHS’ Latino liaison and minority languages coordinator. Latino-focused efforts such as “The Big Read” and the book club empower both parents and the entire community through education and leadership, Fernando said. She also said she hopes these programs will make reading literature a more central part of Latino communities in Evanston. The next events for “The Big Read” include the first meeting for the book club on Sept. 29 at ETHS and a crafts program at EPL on Oct. 3.